The pojangmacha isn’t one of the most touristy topics you hear about Korea—Seoul, in particular. But it should be. While you can spend a bit (or a lot, really) of your cash in the nice restaurants the South Korean capital can offer, you shouldn’t miss out on the street food. Pojangmacha basically means “food stall,” of which Seoul’s streets and corners have plenty. Think of it as their version of our manong isaw stands or food bazaars. They’re exciting, you won’t know what you’ll get. Most of the time, the food’s delicious and most of time, it’s cheap! We listed down 8 food items you should probably spend your won on. 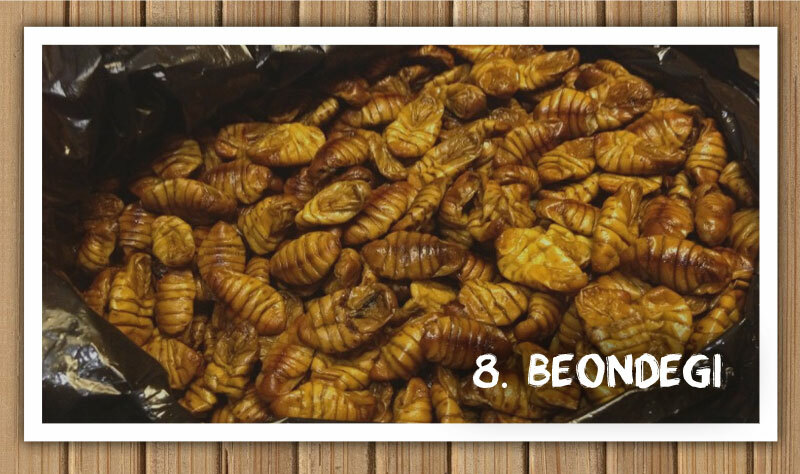 Beondegi is cooked silkworm pupae. It’s steamed or boiled, seasoned and served by the cup. It’s an acquired taste but it’s very Some don’t like its shape, pungent smell and chewy texture. But this exotic snack is rich in protein and really filling. Pojamachang (or street vendors) selling beondegi are dwindling these days, and they can be usually found in front of amusement parks or other hot spots. Bungeo-ppang got its name from its fish-like shape. The sweet snack is molded in the shape of a bungeo, the Korean term for carp. 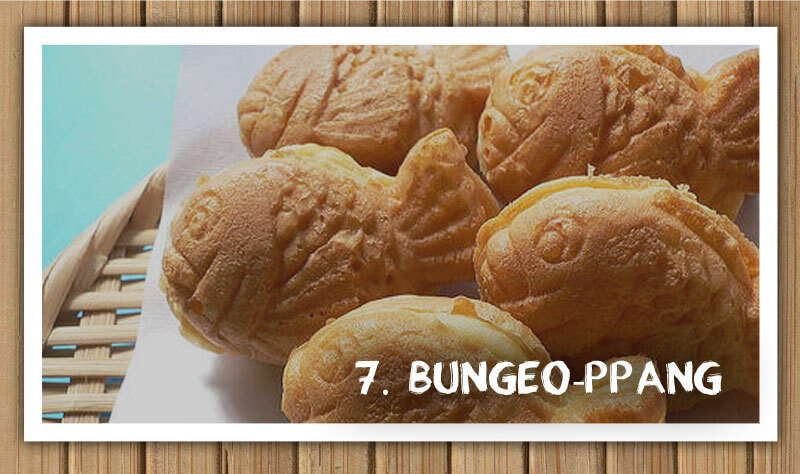 Made from pancake batter, this baked goodie is filled with red-bean paste. It is crispy on the outside and gooey on the inside. Some vendors make this snack in the shape of a flower and called it gukhwa-ppang. Others sell gyeran-ppang, same sweet snack but has an egg filling instead of the usual red bean filling. Another sweet snack is ho-tteok, basically a cinnamon-and-brown sugar filled pancake. Flour and sugar are kneaded together to create a dough. Sometimes vegetables are added to the batter. It is then shaped into a small ball, with a sugar and cinnamon filling. It is often fried on a griddle and flattened using a special spatula. Considered a winter snack, but it is also good during summer or perhaps all year-round. In Busan, one can find the nuts-and-seeds version, while some vendors have the green tea filling. 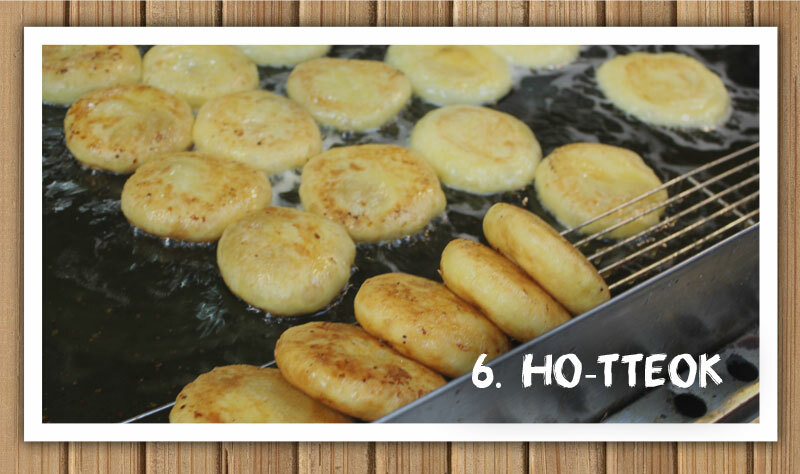 Probably the cheapest snack you can find in Seoul is the odeng or fish cakes. 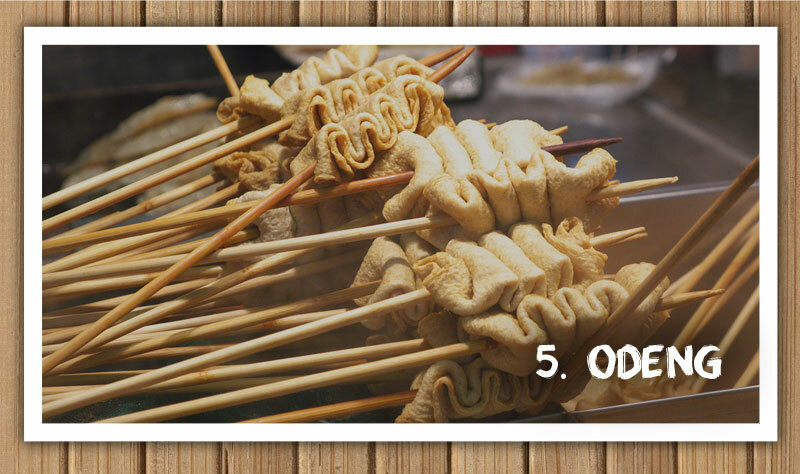 Popular during the winter season, odeng is made from ground fish which are skewered and cooked in a broth made from radish and green onions. You don’t even have to order for this one; rather, you can just grab a stick and start eating. While you are at it, pick a cup and pour some of the broth in which the odeng are soaked in. The broth is completely free and you can drink it at your heart’s content. When you are done eating, the vendor will count the skewers and tell you how much you have to pay. We are not talking about the cool goodness of ice cream. Korean sundae is actually a traditional sausage made from pig intestines stuffed with a mixture of bean curd, vegetables and potato noodles. Some vendors add coagulated blood in the filling. One order of sundae comes with a side dish of gan (liver) and naejang (innards), but you can always tell the vendor if you don’t want any side dishes. Twigim or deep fried snacks abound the streets of Seoul . This is the Korean version of Japanese tempura. You can absolutely find it everywhere. People often choose this snack because of its variety. You can opt for gyeran (hardboiled eggs), goguma (sweet potatoes), saeu (shrimp), dumplings, yachae (assortment of vegetables ), ojingeo (squid), mandu (dumplings) – all fried to golden perfection. When you order this snack, you can mix and match. 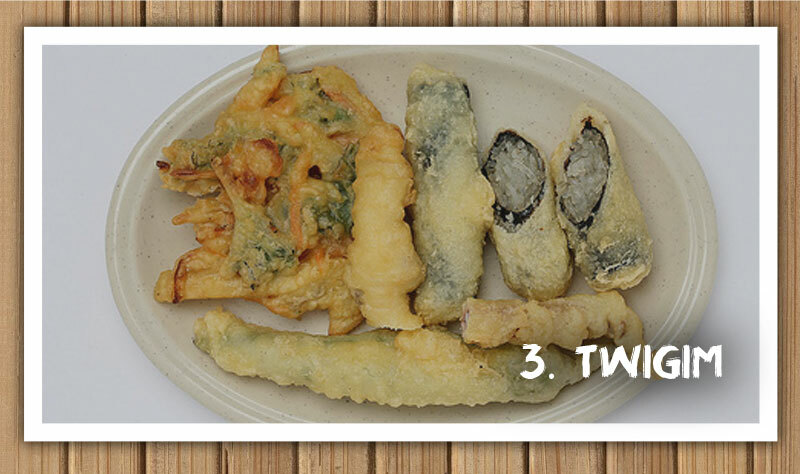 One serving can be a variety of fried goodies (for example, two squids, one dumpling and one vegetable in one serving), or you can just load up on one item. Dip it in soy sauce. Or ask the vendor “Mucheo jusseyo” which means “Put some sauce” to give your fried snacks some added kick. Another must-try street food in Seoul is the Tteokbokki, a spicy rice cake dish. It is made from rice powder which is steamed and shaped into cylinder-like rice cake called garaetteok. It is then cut into finger-size pieces and cooked in a spicy and sweet gochuchang (red pepper) sauce. Some vendors add vegetables, meat, odeng or ramyeun in the mixture. 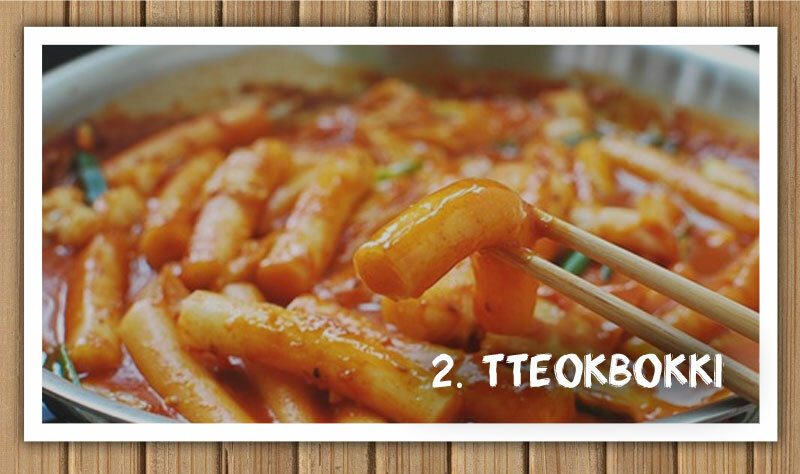 Most Koreans order the set menu “Tteok-Twi-Sun,” a combination of tteokbokki, twigim and sundae for 5,000 won (P214.50). 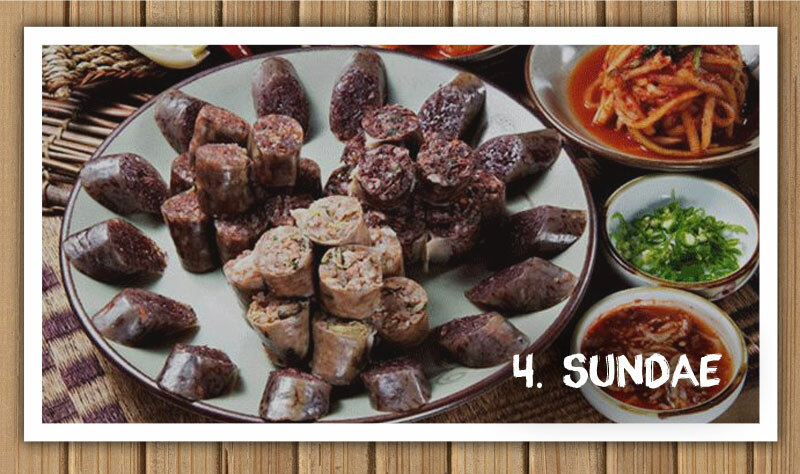 Try also the “Gim-Tteok-Soon” which is a set of gimbap, tteokbokki and sundae. Perhaps the most popular among the street food is Gimbap. 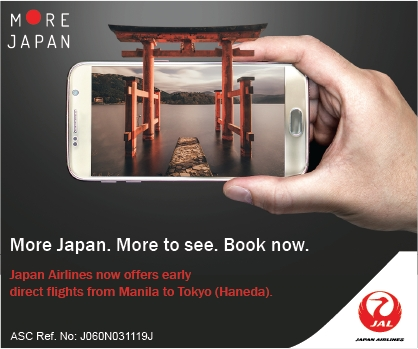 Most people often likened it to a sushi roll. The cooked rice is slightly seasoned with sesame oil, sesame seeds and salt, and then it is placed on a sheet of dried laver or seaweed. Strips of ham, fried egg, pickled radish, cucumber and other ingredients are then arranged on top of the rice and then rolled. 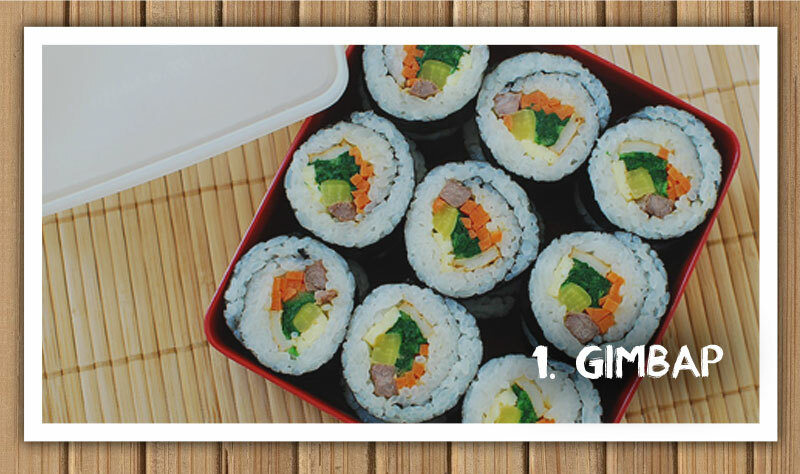 Often sold in a mini-roll, one can find gimbap almost everywhere—at the convenience store, Korean fast food shops and particularly snack stalls.